St. James’ Church Cross was designed by Edwin Lutyens and was given a Grade II listing on 13th July 1974. In 2015, it was decided that all Lutyens memorials would be given listed status. 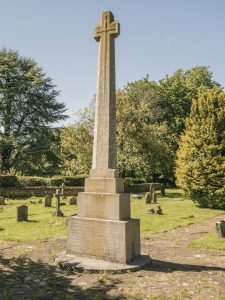 In 2014, Museum Chairman Nigel Arch presented a talk on the Evolution of the War Memorial, which included the history of the Abinger Cross. The Lewin family were well known in the local area. One very well known woman in the mid-19th century, Harriet Grote (1792-1878) was born a Lewin, who lived at The Ridgeway in Shere. The organised feminist movement was emerging in the mid 19th century and she lamented being born a woman. She supported the married woman’s property act and extension of the vote to women and regretted when the campaign for women’s vote got under way in the 1860s that she was not 30 years younger and might have been able to lead it. Her later years she devoted to writing. Her nephew (son of her brother, Frederick), was Thomas Herbert Lewin who lived at Parkhurst in Abinger in late 19th/early 20th century. He bought Parkhurst in 1884 (b. 1839 and lived there until death in 1916). His wife Margaret is buried at Abinger church. She was very involved with Bertha Broadwood’s Holt-Ockley nurses locally. According to the reminiscences of Jocelyn Bray Col Lewin of Parkhurst was involved in local cricket and the family gave ‘proper’ dances at Parkhurst. Colonel Lewin published a book called The Lewin Letters – a selection of the correspondence of an English family 1756-1885 in 1909.